We all know white goes with everything but sometimes we need a little color in our lives. Decades of scientific studies have shown that colors, tones, and patterns can have a profound impact on our metal wellbeing and our perception of the world around us. For example, colors and patterns that resemble what we see in nature can have a calming effect, while bolder colors like red can make us more alert and cautious. Interior designers and decorators use their arsenal of colors to create rooms with different effects to match their intended purposes but does it really make sense to take that attitude in a space as simple as a closet? When you consider how we use our closets it actually does. The closet is often one of the first places we got to when we get out of bed to plan out our outfit for the day and the last thing we see before we sleep. A colorful closet in natural tones could help calm the mind as we get ready for work. Adding color to your closet doesn’t have to break the bank. 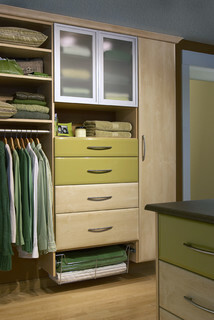 Take this closet for example where an olive green acrylic finish was used for the top two drawer fronts to give just a splash of color and interest without the cost that would be associated with doing an entire closet in an acrylic finish. Modern Closet by Minneapolis Closet & Home Storage Designers Twin Cities Closet Co.
Painting an unused accent wall a different color can create drama and lead the eye to through the space. This closet had its back wall painted red as a way to lead the eye to the striking view of the skyline in the window. The color and texture of wood finishes can give off a warm and comforting feeling. Traditional Closet by Chicago Interior Designers & Decorators Branca, Inc. If you’re the adventurous type painted wood may be the best way to get the color you want that may not be popular enough to be carried by the laminate companies. This will drive up costs considerably however. Eclectic Closet by Sumter Architects & Designers Nicole Norris Design Studio, Inc.